The strength and stability of democracy has become a subject of intense debate in the United States and around the world. But how do Americans feel about their own democracy? As part of a year-long effort to study “Facts, Trust and Democracy” Pew Research Center has conducted a major survey of public views of the U.S. political system and American democracy. 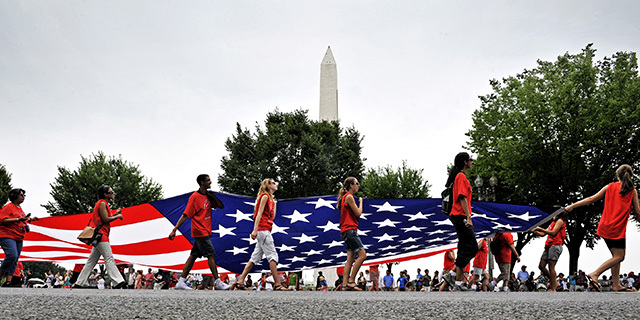 The survey finds that while Americans are in broad agreement on important ideals relating to democracy in the U.S., they think the nation is falling short in realizing many of these ideals. 1Democracy seen as working well, but most want “significant” changes. About six-in-ten Americans (58%) say democracy is working well in the U.S., though just 18% say it is working very well. At the same time, a majority supports making sweeping changes to the political system: 61% say “significant changes” are needed in the fundamental “design and structure” of the U.S. government to make it work in current times. 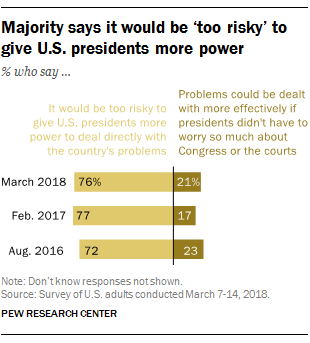 2 Most Americans say it would be too risky to give presidents more power. About three-quarters of the public (76%) say it would be “too risky” to give presidents more power to deal directly with the nation’s problems. Just 21% support the view that problems could be better dealt with if presidents could worry less about Congress and the courts. Since 2016, Republicans have become less likely – and Democrats more likely – to say it would be too risky to give presidents more power. Still, large majorities in both parties (70% of Republicans and 83% of Democrats) oppose the idea of giving presidents more power. 3About a third say “who the president is” makes a big difference in their personal lives. Most Americans say “who the president is” has a big impact in areas such as national security and U.S. standing in the world, and 63% say it makes a big difference in the country’s mood. Fewer (34%) say who the president is makes a big difference in their personal lives. Women (40%) are more likely than men (29%) to say the person who is president makes a big difference in their personal lives. 4 Democrats have grown less positive about elected officials who compromise. In the past, Democrats were more likely than Republicans to have positive views of elected officials who make compromises, but that is no longer true. 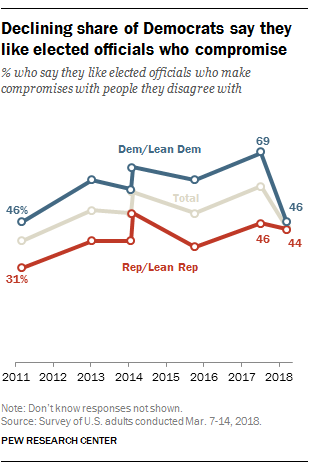 Today, nearly equal shares in both parties (46% of Democrats and 44% of Republicans) say “they like elected officials who make compromises with people they disagree with.” As recently as last year, Democrats were 23 percentage points more likely than Republicans to have positive views of elected officials who compromise. 5Most Americans say policymakers should heed the will of the majority even if they and their supporters differ. Three-quarters of Americans say that in a hypothetical scenario a governor should sign a bill that has support from most people in their state, even if most of his or her supporters oppose it. But smaller majorities of Republicans and Democrats hold this view when the governor is a member of their own party. 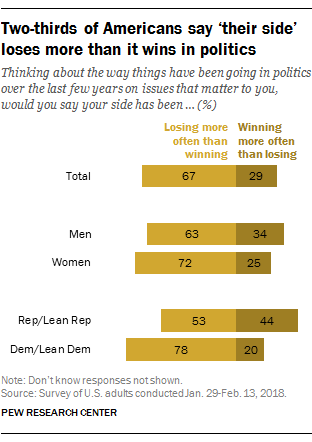 6 Most partisans say their side in politics is “losing.” A large majority of the public (67%) says “their side” in politics has been losing more often than winning in recent years on issues that matter to them. As in the past, this sentiment is less pronounced among those who support the party in control of the White House than the party out of power. Even so, more Republicans and Republican-leaning independents feel like their side has been losing more often than winning (53% to 44%). 7 Government and politics seen as working better locally than nationally. Two-thirds of those surveyed (67%) have a favorable opinion of their local government, compared with 35% for the federal government. In addition, nearly three-quarters (73%) say the quality of candidates running for local office in recent elections has been good; just 41% say the same about the quality of presidential candidates.